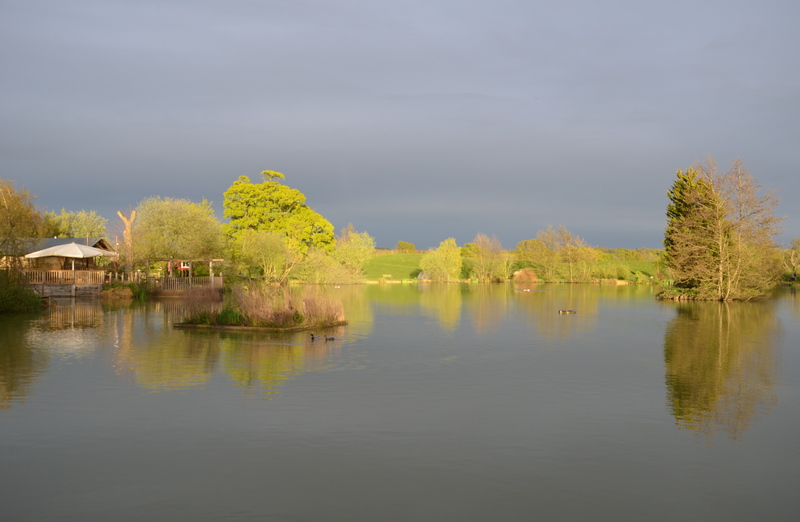 For the first week of May this year, my wife organised a week’s holiday with my parents at Sumners Ponds staying in Moorhen Lodge. This three bedroom lodge borders the main lake which contains carp to 36lb. We arrived at a very busy site during the bank holiday weekend – it is worth remembering that first and foremost the place is a campsite and holiday location, and that the fishing seemed to be a secondary attraction for most of the visitors, so there was quite a bit of noise with radios playing and tent pegs being hammered in. Shortly after arriving on the Saturday Dad caught a small number of bream on the feeder with double maggot on the hook. We then went over to the Cafe By The Lake for a nice dinner with live music. I would recommend a visit to the cafe if you are looking at staying here as the food was very decently cooked. Fishing on Sunday was more of the same, although I had my first bream of about 2lb which had somehow managed to gut an 18mm boilie and hang itself on a size 8 – it quite struggled to move the 2.5oz lead it was attached to. Monday morning came and the place cleared out, most left the lake lodges, un-pitched their tents and drove away in their motorhomes. The noise was gone and we had the lake to ourselves. We also experienced the only bad weather of the week, but this combination of peace and quiet and rain saw my rods roaring away in the late afternoon, and in fairly quick succession I caught carp of 15lb, 18lb 8oz and a new PB of 23lb 8oz. As most bites seemed to be forthcoming in the early evenings, I spent two days with my wife visiting Petworth House (£15), Bramber Castle and Boxgrove Priory (both free). Since it was also close to her birthday, my parents took us out for dinner at the Michelin-starred Tristan in Horsham, which was a fun meal with reasonable prices for such an establishment. 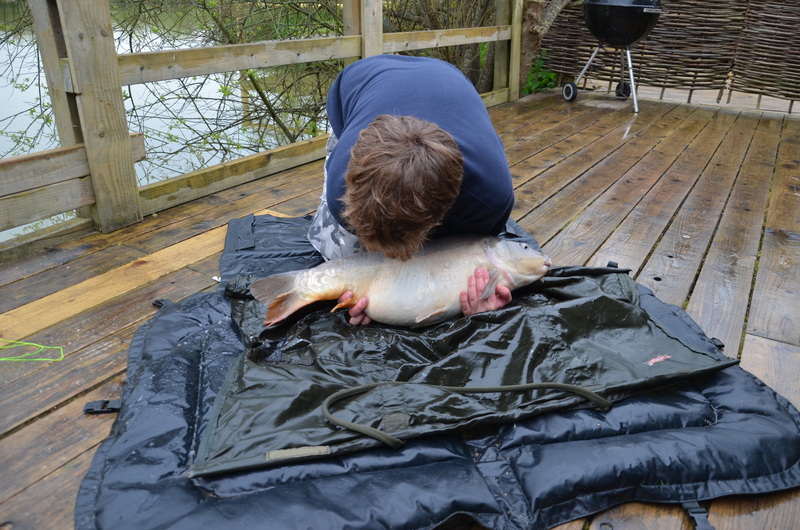 Later in the week as the water warmed up, the carp were out on the top. During the day, Dad and I would sit back from the edge and wait for them to come in close on their patrols before sniping a free-lined dog biscuit over their heads. 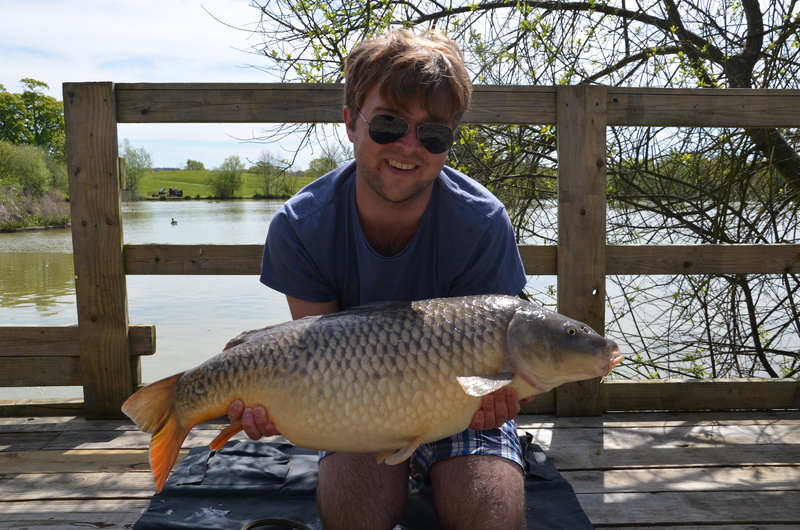 This resulted in Dad’s first carp of the week, a PB Cyprinus Carpio for him of 18lb 12oz. There was a twenty-plus Ghost Carp among these regular visitors but this fish would prove to be the wariest of all, and would reject the bait if it was anything but perfectly presented. I had one solid chance during the week but struck into nothing as the carp sucked the biscuit down. I was absolutely gutted as I really thought it was mine that time. However, on the Friday morning I had my surface-caught PB of 19lb 8oz – while still barefoot in my pyjamas, so I can’t complain. A number of other carp were caught during the week with a total of nine for me and three for Dad. Come Friday afternoon Sumners started to fill up again. The guy pitching his tent to the left of our lodge started casting out some ridiculous fish-finder the size of a tennis ball complete with accompanying phone app – not sure what this was going to achieve, and the man to the right cast over my line – I reeled it in and snapped his off, fortunately. With tent pegs galore being banged in, the carp on the surface started to drift toward the centre of the lake and no more action was forthcoming. We decided to bring in the rods for our last night and enjoy a nice meal and a glass of wine (or ten), instead of persevering with slim odds. We really enjoyed ourselves, but the fish seemed quite disinterested during the weekends while the banks were busy and noisy. Overall, I would thoroughly recommend a visit to Sumners – but skip the weekends and go during term time. Photos by Lara Ruffle Coles.